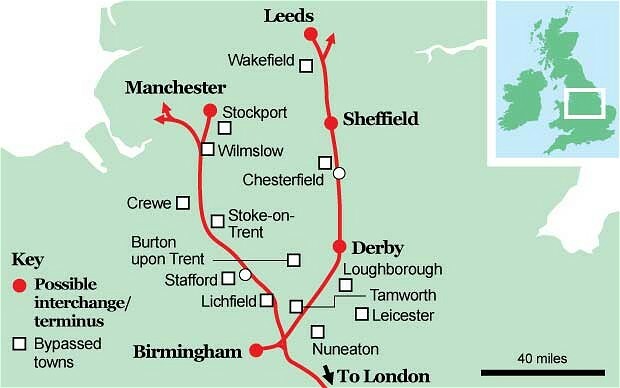 A news story in the Telegraph today reveals a map showing where HS2 will go North of Birmingham. Another piece guides people to more detail about affected areas and the relevant MPs. If you know anyone affected forward onto them and tell them they need to raise awareness in their communities, with their local MP and in their local press. There is only 6 weeks left for them to have their say in the consultation. Remember this is a vanity project to scar the country with hundreds of miles of unnecessary concrete, steel and electricity cables. This entry was posted in Uncategorized and tagged Derbyshire, Leicestershire, Manchester, map, North, Stoke, Telegraph, Y route. Bookmark the permalink.